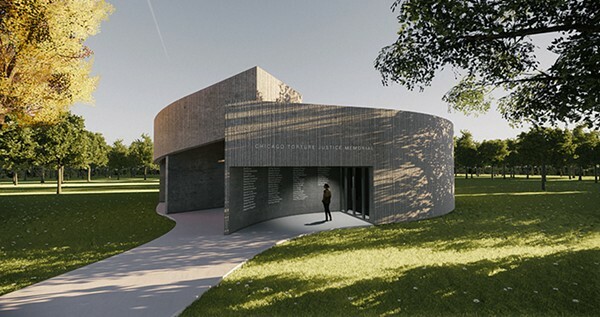 Patricia Nguyen and John Lee's design for memorial for Burge victims. Courtesy of "Chicago Reader"
The Chicago Reader recently reported that Chicago Torture Justice Memorials (CTJM), a collective which includes SAIC faculty members, alums, and students, is working to help build a memorial to honor survivors of torture perpetrated by former Chicago police commander Jon Burge and those working under his leadership. CTJM originally worked to pass the historic reparations ordinance, which the Chicago City Council passed four years ago. "The ordinance called for: $5.5 million in reparations to dozens of Burge's victims; free City Colleges tuition for victims and their families; the creation of a south-side mental health and vocational training center to address the needs of survivors; the development of a mandatory Chicago Public Schools curriculum about the history of Burge's deeds; and the creation of a memorial to honor survivors 'and the struggle for justice on their behalf,'"reports the Reader. The exhibition, Still Here: Torture, Resiliency and the Art of Memorializing, which showcases six designs for the future memorial debuted at the University of Chicago Arts+Public Life gallery last week. "At the conclusion of the exhibition a jury of survivors and their families, as well as artists, architects, community organizers, philanthropists, and educators, will deliberate to select the winning design. The next step will be finding a site and raising the several hundred thousand dollars needed for the creation of the monument," says the Reader. Read the full article on the Chicago Reader's website.